Three policemen have been killed in a shootout with two other officers at Mexico City’s main airport. Officials say those shot dead were attempting to arrest the two officers who are suspected of involvement in a cocaine trafficking ring. Passengers dived for cover when the suspected traffickers opened fire, killing two officers immediately and injuring a third who later died. The two suspects escaped and are being sought by the authorities. Officials said they had spent 18 months investigating corrupt federal and local officials who they suspect are part of a drug trafficking ring operating at the airport. 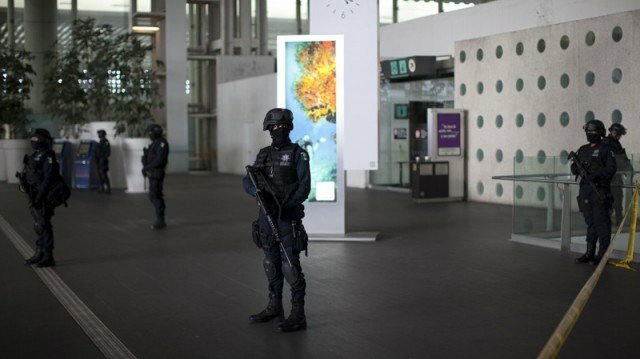 The area was sealed off immediately after the incident but flights were reported to be operating normally in and out of the airport. The two officers have been identified, authorities said. Shootings in public spaces in broad daylight remain rare in the capital, which has been largely insulated from the violence seen elsewhere in the country. Though traffickers use the capital’s main airport to move drugs, money and illegal migrants and have seized 440 lb (200 kg) of cocaine there so far this year, violence related to drug trafficking seldom occurs in passenger areas. Reuters reports that gang violence has been growing in Mexico City and its suburbs, with around 300 gang-related murders last year.